Hello everyone! Rita & André here. Here goes Part I of another (big) adventure we've embarked on not too long ago. 2015 was the year we decided to go on our first trip to foreign lands. We'd been dreaming about a Scandinavian retreat for ages and it took a lot of self control from the both of us not to book three whole months of travelling all across Scandinavia. Months passed before we finally settled with two weeks spent mostly in Norway and also in Sweden. Here's how we planned our summer scandinavian holidays: we defined our goals and musts for the trip and everything else was thought through accordingly. We knew we wanted to drop by Odda (check) so we could hike all the way up to Trolltunga (double check), take the train from Bergen to Oslo (triple check), and finally spend a few days in Stockholm (quadruple [!] check). And so we scheduled our itinerary around these ideas. Once it was all settled and booked, all we had left to do was wait patiently until our departure date was finally around the corner. After two flights, we landed in Bergen, where we were staying for two nights. Nothing quite compares to the view from the airplane window when you're flying over Norway. The mountains, the fjords, the green scenery. It was one of the most magical places we've ever visited, and we'll never forget the moment we first caught a glimpse of this beautiful country. We arrived at the airport in the evening, at about 8:30 pm, and after the half hour bus ride to Bergen we were right in the center of the city, excited to start wandering around. We stopped by our hotel, dropped the luggage in our room and got back to the center in a matter of 15 minutes. It was 10 pm and the sun was shining bright. 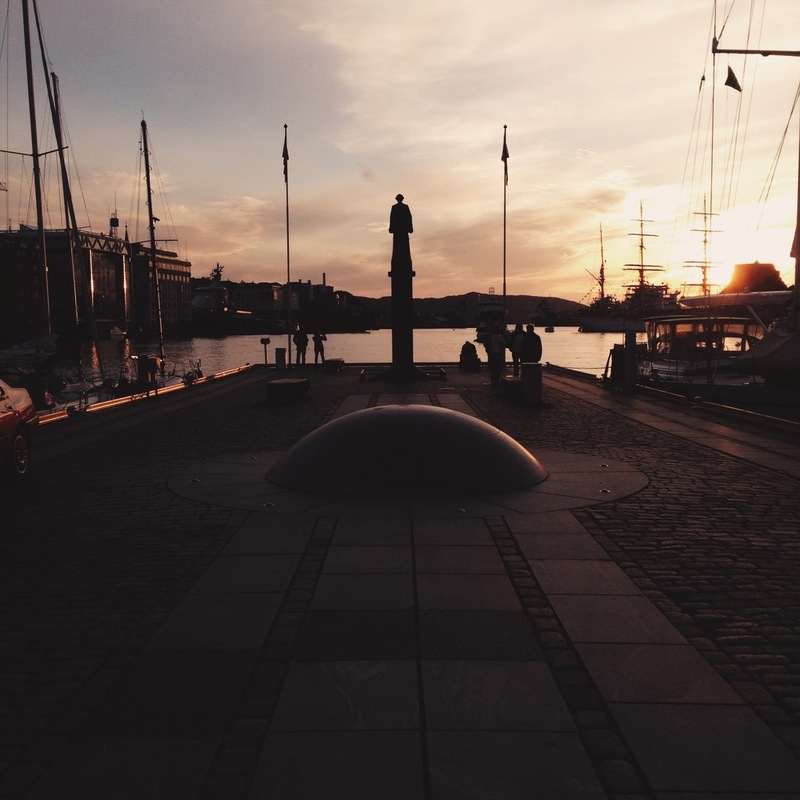 The sun sets at 23 pm, but there is no darkness at night during the summer in Norway (omfg wut!). The first thing we did was visit the old Hanseatic wooden buildings of Bryggen. One of its earliest constructions has been dated to around 1100, but since then the area has suffered many fires. 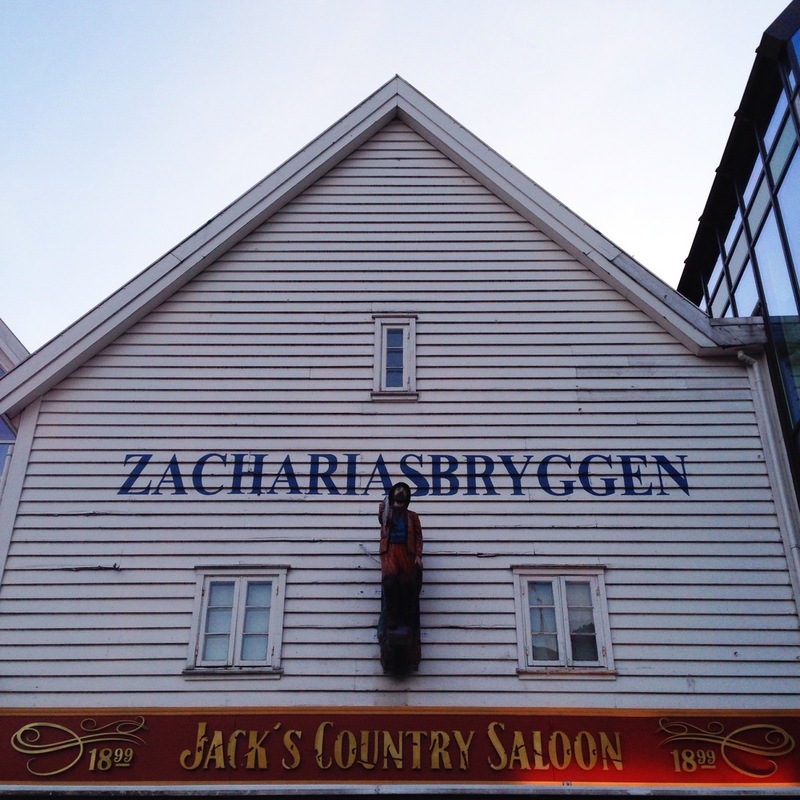 About a quarter of Bryggen's buildings still dates back to the 18th century, but the majority of the site consists of much younger structures. As of now, Bryggen beams with life from all the museums, shops, restaurants and pubs that are housed there. The buildings are perfectly neat and painted in bright colors, and its balconies are adorned with flowers. It's a whimsical place that definitely makes you feel like you've suddenly been transported to another period in History. After getting a first glimpse of Bryggen, we wandered through the city's famous fish market, sat near the docks and watched the late night sunset. How enriching it is to be able to travel to such places and absorb the beauty in the simplest of moments, a sunset. We were simultaneously exhausted from our flights and ecstatic with the reality that the golden hour stretched through the wee hours of the night. After taking about 34519855 pictures of the sunset, we got to our hotel room and feel asleep as we watched the bright pink clouds float around in the sky. On our first morning in Bergen, we woke up early and had breakfast at the hotel. We walked around the city and got to know a few little streets and corners. We took the popular 6 minute funicular ride to the top of Mount Fløyen where the view of the city is nothing short of spectacular. Atop the Mount we wandered through the woods and ate a little snack by the Skomakerdiket Lake. After visiting Mount Fløyen, we got back to the center of Bergen and stopped at the lovely Pygmalion restaurant where we had veggie wraps and baked potato wedges for lunch. Since it was Saturday, we had the chance of getting to know Bergen's Farmer's Market where we had the yummiest of pancakes for dessert. We dropped by Bryggen again so we could visit all the little shops (and drool over all the scandinavian design goods at Røst!) and galleries we'd seen the night before. We continued to walk around Bergen and suddenly found ourselves in the hipster part of town, where all the funky street art, hip cafes & pubs, antique stores and cool barber shops are. We had dinner at the lovely italian restaurant Da Stefano. After finishing our meal, we walked outside and basked in the beauty of the norwegian sunset once more. As tired as we were after spending the whole day on our feet, we stayed up late and soaked in the city's night-life. We woke up early the next morning, walked to the bus station and caught the bus to Odda, where we stayed for 3 nights and accomplished some amazing feats. You can read all about in our next post Odda (Norway & Sweden 2015 - Part II).